It usually affects very young kids (usually less than 2 weeks old) causing acute haemorrhagic to muco-haemorrhagic enteritis resulting in death. The kids may die within a few hours or 1-4 days. The Clsotridium perfringens B produces alpha, beta and epsilon toxins. The reason neonates are more susceptible to the Beta toxin is that trypsin is not secreted in sufficient amounts by the kids to inactivate the toxin. It is interesting to note that goats with a high levels of brown stomach worm causes the pH of the abomasum to rise which in effect causes trypsoinogen not to be converted to trypsin. The toxins in the intestinal tract cause’s necrosis of the tissue and ulceration leading to increased peristalsis and diarrhoea. Kids die from dehydration, acidosis, toxaemia and shock. The condition is usually seen towards the end of the kidding period. If the disease has been prevalent the previous season then it can be seen within the first 2 weeks of the next kidding. Young effected kids usually die without showing clinical signs. As many as 20-30% of kids may be effected. Those kids showing signs (usually older 2-4 weeks) may have abdominal pain (reluctant to stand and when lifted may stand with an arched back(, bleat and have diarrhoea which may be brownish-grey and blood stained. The diarrhoea has an offensive smell. 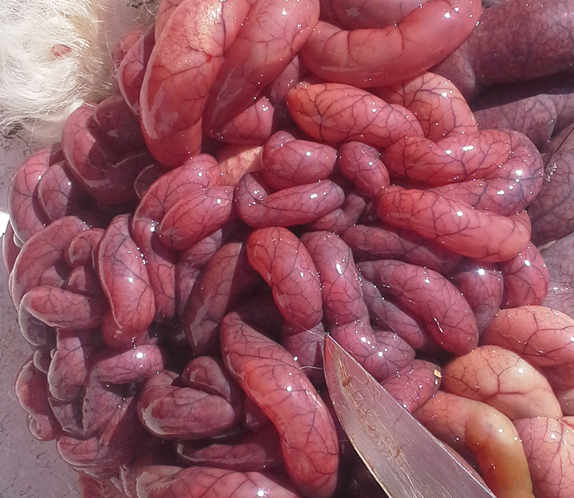 There may be serous or blood stained exudate in the peritoneal cavity. The liver and kidney shows signs of degeneration. Oedema and congestion of the lungs usually occurs. Fluid is found in the pericardial cavity. Epi and endocardial haemorrhages are frequently found on the heart muscle walls. Severe haemorrhagic enteritis is found. Small ulcers, pin head up to 10mm may be found on the mucosal lining. Symptoms are similar to Escherichia coli but ulcers are absent. Treatment is usually not feasible due to acute nature of the disease. Antibiotics (Tetracyclines and penicillin) can be effective in mild cases combined with supportive treatment. Isolate the kids and ewes. Move healthy ewes and kids away from the area to an area where they have not previously kidded. Tetracycline or penicillin antibiotics with supportive treatment for milder effected kids. VACCINATE the ewes and ensure a booster vaccination is given 4-6 weeks before kidding to ensure high level of antibodies in the colostrum. 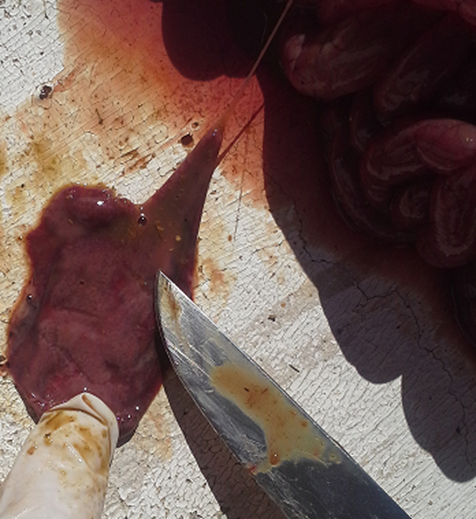 OBP Lamb Dysentery: Ewes vaccinated 4 and 1 week before kidding and boosters 2 weeks before kidding.